How to Install Garage Door Opener? Most of the people face difficulty while opening the Garage Door. So we are providing the easiest method of installation of Garage Door Opener here. Know the step by step procedure of Garage Door Opener Installation and complete the process by yourself instead of paying for someone else. Installation takes only a few hours to complete which fixes all the movements of closing and opening the door easily. How to Install Garage Door Opener? The installation guide provided here gives you some steps to follow for the installation of door and also the hardware that is required for the installation. While installation, be sure that every process is done perfectly and installed properly to assure a fault-free, durable and secure services. For the installation of Garage Door Opener, the individuals require proper knowledge and preparation. Maintain the necessary tools to fix the complete tools in its place. Also, read and follow all the instructions before starting the installation process. Check below for the step by step procedure to be followed for the process of installation of garage door opener. Here are some of the safety measures to follow. Check those to know How to Install Garage Door Opener. Make sure that the garage door opener control button is in the right position and also out of reach from small children. Check the owner’s manual and learn how to use the emergency release feature. Inspect the garage door visually every month. Look at cables, springs, pulleys, and rollers for signs of wear. Do not remove, repair or adjust these parts attached to them. Test the door garage reversing system monthly by placing the 2×4 board in the door’s path. Do not leave the garage door partially open because if it is activated again it may travel downward and come in contact with an object in its path. There are various steps to be followed while installation of garage door opener. These are as follows. There are four steps involved in the preparation of garage door opener. Refer those to know How to Install Garage Door Opener. The new garage doors with multiple horizontal sections should be well-matched with an opener. Most of the older types of one solid piece need to be replaced before installing an opener. 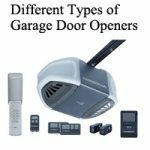 There are 4 types of garage door openers. They are belt driven and chain driven, screw driven and direct driven. Almost both the Belt Driven and Chain Driven garage door openers operate in the same way but there is a slight difference in the part of the operation. Know all the operations of various garage door openers and find out the one from the 4 garage door openers. Follow the installation process according to the specific door opener. Make sure that the garage door is properly operated and lubricated. The garage door weight is mainly supported by pulleys, cables, door springs but not by the opener. Check whether you can lower and raise the door normally if not repair the door and then start installing the opener. To avoid tangle during the installation process remove all the cords, ropes and cables. To avoid damaging the opener or cause of personal injury or any accidental engage, deactivate or disconnect all the existing garage door locks before installation. They are generally fixed in the ceiling facing down. You need to install an electric switchboard or have one already installed by the licensed electrician. Before attempting the wire connection make sure that the power is disconnected at the main breaker box to install a new permanent electric wire. In order to avoid the electric always make sure that the power cord of the garage door opener is connected to the properly grounded outlet. There are seven steps to be followed in installing a garage door opener. Make sure the parts included in the package matches with the list of parts included with the opener. The opener will have a list of detailed instructions for installation, so follow all the instructions to start assembly. As directed in the installation instructions first keep the rail together, this should be available in several pieces that fit together. Then the carriage (known as a trolley) needs to be slide over the rail which pulls the door open. The largest part of the opener is the motor compartment. Attach the motor compartment to the rail which will be positioned far from the garage door. Opposite to the motor compartment, install the pulley at the end of the rail. Feed the chain or belt through the end of the rail and around the pulley and then to the other end of the motor. Finally, the end of the belt or chain is attached to the carriage. The screw should be available at the end of the belt or chain as it allows you to adjust the tension of the belt or chain and can easily attach it to the carriage. In this step, you can attach the garage door opener to the ceiling. The detailed specifications for blocking are available in the instruction manual available. Make sure that the blocking is attached to the joists (solid wood) in the ceiling irrespective of its size and spacing but not to the sheetrock. The distance from the garage door to the top should be specified in opener’s direction and in most of the cases, you will center it on the door. If the garage door opener didn’t come with the bracket, you have to consult the instructions to determine the type of bracket you need. Attach the opener came with the wall to the bracket above the door and insert the assembly end into it. Connect the assembly end and bracket as given in the installation instructions. Install the power unit at least 7 feet from the floor so that the tall people won’t run into it. In most of the cases, two pieces are present to attach the door to the opener. It gives flexibility in connection as the distance may vary between the door and the opener. There are some steps involved to install the additional features. Check those to know How to Install Garage Door Opener. Garage Door openers should have a manual disconnect code so that it should be adjusted approximately 6 feet above the floor so that any adult can reach it. It is suggestible to have a bulb of appropriate wattage inside the compartment. But it is better to buy a light bulb which is rated as rough service in order to withstand the vibrations which the opener emits. Whenever the door is opened, the light will turn on and can also be operated manually as well. Be very sure to install a light bulb in the opener so that the program of the garage door can be successful. Most of the Garage door openers use the light to signal the programming changes that occur in it. At the bottom on one side of your garage door, you need to run 2 small wires. Fix an electric eye in that location and fix reflector on the opposite location of the door. Be very sure to follow the instructions given in the manual. Fix it in such a position that everyone can operate it and see it. Also, program and install other equipment such as a keypad for opening the door from outside the garage or door openers. Refer to the instruction installation manual and follow all the safety measures. If the opener and the door are moving without any problem and smoothly and if there are no obstructions in blocking the door and in the movement of opener that it is fine. Some of the garage door openers make little loud noise even in normal condition but do not worry that it is not properly installed. Another thing to know in this How to Install Garage Door Opener guide is Placement. In order for an opener to function properly, make sure the position of the motor and opener is fixed correctly. By raising the opener onto a step ladder, you can take the help of it if the ladder is not tall. Open the door to the full extent and now position the opener at a proper angle away from the ceiling by resting the rail on 2×4 flat laid. When the door is raised up, if a panel or top section hit the trolley or carriage, then pull down the trolley which releases arm to disconnect the outer and inner sections. Now, move the outer trolley towards the motor unit. Until the installation process is completed, the trolley remains disconnected. Ensure that the rail and motor unit are centered above the door before connecting the motor unit to the ceiling. As mentioned in the sectional door with the track, follow the first two steps in the same manner. The difference comes with the position of the door and the opener. The top of the door and the top of the opener should be at the same level. The position of the opener should not be more than 4 inches from this point. To know more on How to Install Garage Door Opener, visit our Best Garage Door Opener portal regularly.